Dressing up kids is fun. Halloween with kids is fun. We've only gone trick or treating maybe 3 times in their whole lives, but tonight we ventured out. We live in a pretty family friendly neighborhood with lots of older neighbors. We hit about 3 blocks and had more than enough candy between all kids. The last house, we hit, across the street from us gave us most of their candy since they said we were only the third set of trick or treaters they'd seen all night. My oldest was Ash Ketchum from Pokemon. 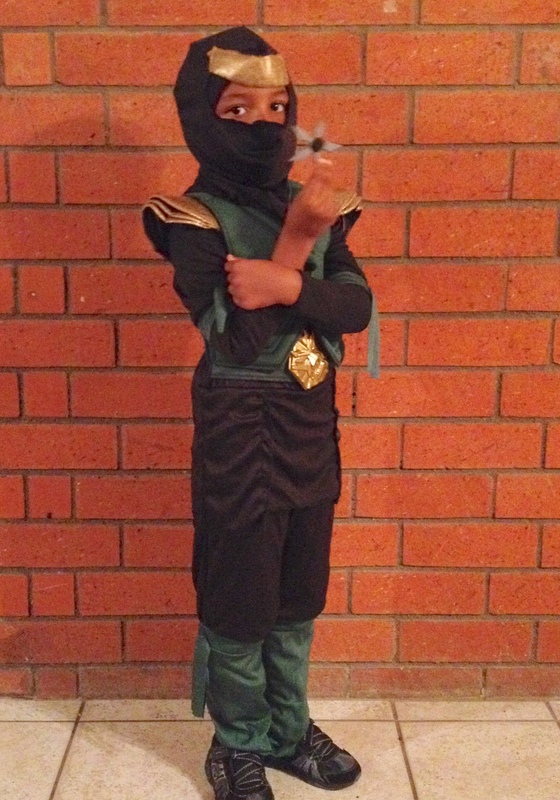 The six year old was a ninja and baby girl was Doc McStuffins. (And I couldn't get her costume on fast enough for her.) After about a block, she finally got into the swing of things and was saying "Trick or treat" and "thank you" by night's end. We went through the candy, rationed it out and then set aside what we don't like. We were hoping to give the "dislike" candy to trick or treaters, but the doorbell didn't even ring one time. Looks like the threat of rain put a damper on things here in Southern California. So anyone want some Baby Ruth or Butterfingers? We've got plenty!